I was asked to do something with the wonderful Gary Northfield for our local Crystal Palace magazine, called the Transmitter. Of course, we couldn’t say ‘no’, as we love them so! 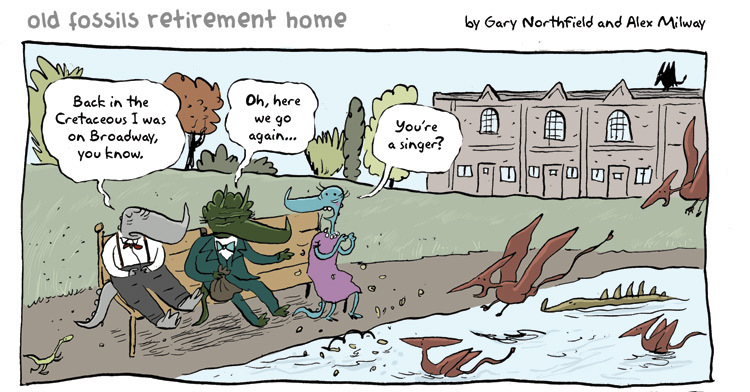 So… taking the Palace’s dinosaur pedigree, and Gary’s skill at drawing them, we came up with the Old Fossils Retirement Home comic. Here’s the first panel, and to read the rest you’ll have to get yourselves down to South London in about a month’s time and find a copy. The Bookseller Crow independent bookshop always has them on display! click image to see it bigger!